BATON ROUGE, La. (AP) — Louisiana welcomed federal flood-protection money in the wake of Hurricane Katrina in a deal that didn’t require the state to begin repaying its share for a decade. But now that bill is coming due, and it has ballooned to a dismaying $3 billion because of accumulated interest. The looming payments have Louisiana officials worried the debt will steer money away from other risk-reduction projects in a vulnerable state worried about the next killer storm. And the debt threatens to create new budget woes in a state where the governor and lawmakers reached a hard-fought tax deal that just returned Louisiana to budget stability. “Those numbers are just unbelievable to me,” Republican state Sen. Mack “Bodi” White, of Baton Rouge, said at a recent budget hearing. With Louisiana’s first payment due next year, state lawmakers are bristling at the near-tripling of the cost estimate, particularly since the U.S. Army Corps of Engineers’ work on 350 miles of levees and 73 pump stations has taken years longer than promised and still isn’t done. “The project hasn’t yet been delivered, but the interest started running from the day of the agreement. We think that is a serious problem, it’s unfair,” Democratic Gov. John Bel Edwards said. Louisiana governors and lawmakers could have made advance payments over the years, but they allowed the debt to grow. Now, Edwards, along with Republican U.S. Rep. Garret Graves and other members of Louisiana’s congressional delegation, are trying to lessen the price tag. But their efforts were rejected during former President Barack Obama’s tenure, and they’re making little headway with President Donald Trump’s administration. After Katrina devastated the New Orleans region in 2005, the Corps embarked on a multibillion-dollar hurricane-protection system covering five parishes: Orleans, Jefferson, St. Bernard, Plaquemines and St. Charles. The agreement, finalized in 2009 under former Gov. Bobby Jindal with help from Louisiana’s congressional delegation, called for the federal government to pay the full cost of rebuilding the Corps’ flood-control system that failed during Katrina, along with additional structures authorized in 1965 that weren’t complete when Katrina hit. The agreement also called for sharing the cost of building new projects to help the region withstand a 100-year storm — such as floodgates, pump stations and surge barriers. The federal government committed to paying 65 percent of those costs, and fronting 35 percent to be repaid by the state, with interest accumulating immediately, said Chip Kline, head of Louisiana’s Coastal Protection and Restoration Authority. “They basically gave us an offer we couldn’t refuse. Otherwise, we wouldn’t have anything,” said state Rep. Jerome “Zee” Zeringue, a Houma Republican. Graves, who worked on the deal as Jindal’s coastal chief, said the 30-year deferred payment plan was the only way Louisiana could unlock the federal money. 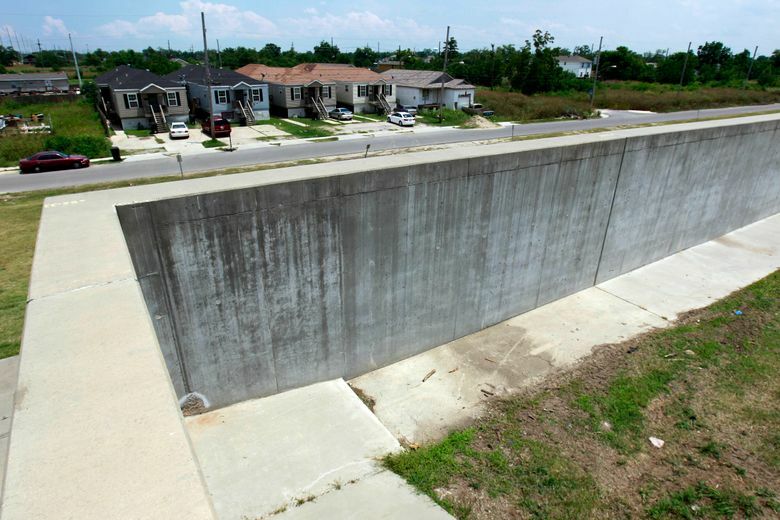 “We got billions from the federal government for levees,” Graves said. Graves said Jindal and lawmakers spent about $250 million in state surplus funds on property needed for the work. The remaining state share of these projects totaled an estimated $1.1 billion at the time, but Kline said that figure has grown to $1.6 billion with interest. Unless something changes, Louisiana will have to repay $3 billion over the next three decades, Kline said, with the first annual installment of $100 million due in August 2020. State officials are particularly irritated that interest began accruing on projects that were supposed to be completed back in 2011. Also, Kline said structural problems have been found in the flood-control system, with the levees not meeting the 100-year-storm standard. The Edwards administration is working with the congressional delegation on proposals they hope the Trump administration would support to lessen the debt. One idea is to offset the debt with hundreds of millions of dollars Louisiana now steers to other flood protection and coastal restoration work. Meanwhile, Graves noted that Louisiana is entering into a similar 30-year deferred payment agreement for a $760 million project to build an 18-mile levee in the nearby St. John the Baptist Parish area, to shield the region against storm surge from Lake Pontchartrain.